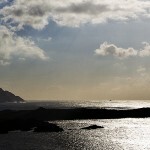 In Ireland’s south west corner, at the tip of the magnificent Iveragh Peninsula, is the Skellig Coast. 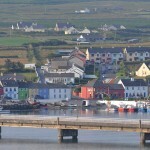 At its heart is Portmagee. The village owes its name to the infamous 18thc. Smuggler, Captain Theobold Magee who, after fighting at the Battle of the Boyne in 1690, found his way to South Kerry. Having grown up in a family of traders in the North of Ireland, he decided that the intricately chiselled coa st around these parts was the ideal location for his own trading business; with the difference of course that he had no intention of paying the Revenue men! His trade in contraband spirits, textiles, tea and tobacco flourished, as it was extremely hard to police and therefore very profitable. He became so well known that the village (formerly known only as An Caladh, ‘The Pier’) became known as ‘Magee’s Port’ then Portmagee. Sadly, this local hero had no heroic death, finally falling ill on a voyage to Portugal and ended up being cared for by the nuns in the Dominican Convent in Lisbon, where he died. His wife and sons however, continued the family’s profitable business in Portmagee. On the face of it, this tiny village – right off-the-beaten-track at the edge of the Wild Atlantic – is hardly more than a row of colourful houses along a quayside. Yet there’s a strong sense of purpose here that gives Portmagee an energy all of its own. Most mornings, adventurous souls wait at the harbour, hoping to visit one of the wonders of the world. 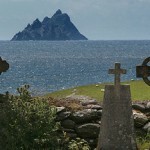 The early-Christian hermitage of Skellig Michael – described by George Bernard Shaw as “part of our dream world” and now a UNESCO World Heritage Site – is 8 miles out to sea. Clearly visible on a fine day, it can only be reached by boat and when the weather allows. But no matter. 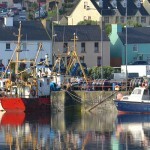 Portmagee – now named Ireland’s first-ever ‘Tourist Town’ (the highest accolade, for the exceptional way the whole place welcomes visitors) – is “perfect for hanging around waiting for the weather to clear for the Skelligs”, says Lonely Planet. And whether en route to the Skelligs or not, you’ll want to slow down and stay a while … watching cloud shadows on the mountains, walking on the strand or along the cliffs, counting stars in the darkest night skies, and rainbows as the Atlantic fronts blow through. There are waves of busy-ness: gulls circle as trawlers return, catches are landed, fish sold, nets mended. There’s banter from the boatmen. And stories are shared of Portmagee’s seafaring and smuggling past. Colourful RIBs and dinghies take folk offshore to dive, sail and see the wildlife. People come from across Ireland to take part in Portmagee’s annual festivals – Set Dancing, Sea Shanties and the traditional Old Year festivities. Come the evening, there are friendly locals and turf fires in the pubs, the freshest seafood to eat, traditional music and set dancing, year round … in this warm-hearted place at the far western edge of Europe. "Portmagee is really pretty and staying in the Moorings made our stay all the more memorable due to its location, the suite, the food in the restaurant and the warmness of the owners and staff"